Watcha? Weird huh? Well, they may be popular British slangs butthey fit right here coz a British Airlines frequent flier programs offers you best redeeming option for domestic flights in US of A.
American Airlines is one of British Airways’ partners and your British Airways Executive Club Avios miles can be used for travel on American Airlines flights. Since British Airways has a distance-based award chart where short flights are very few miles, we can often save loads of miles by using British Airways miles instead of American Airlines. This allows us to leverage the American Airlines extensive North American flight network that includes Canada, the Caribbean, Hawaii and Mexico, through the British Airways miles program. In this post, I will explain the advantages of booking flights with British Airways miles, how to search for award availability and, finally, how to book your award ticket. Within the US: 12,500 each way in economy; 25,000 each way in first class. To Hawaii: 22,500 each way in economy, 37,500 each way in first class. This does not take distance into account and long multi-leg itineraries cost exactly the same as short one-hop flights. Comparatively, British Airlines will charge you as few as 4,500 Executive Club Avios miles for flights under 650 miles and up to 10,000 miles for flights up to 2,000 miles. If the flight you want happens to be short, that’s a big miles savings! With British Airways, you are paying based on distance per segment and each segment is charged individually. So if you fly from New York to Miami and then Miami to Grand Cayman, you are going to pay 7500 miles for the segment from New York to Miami and 4500 miles from Miami to Grand Cayman. That’s a total of 12,000 miles, which is actually better than the 17,500 miles that American Airlines will charge. American Airlines’ route network is very clearly displayed on their interactive route map. You can just select your city and see where you can go. I only included economy flights in my examples for comparison, but miles savings on business tickets can be, of course, sizeable as well. Searching for award availability: We can search for American Airlines award availability on the American Airlines website. It’s much easier to use than the British Airways website and has a convenient calendar view. We can book any seats at the MilesSAAver level we can find. Booking the award seats. To book the award seats, we go to the British Airways website and book online. The best place to search for American Airlines availability is on the American Airlines website. As a bonus, British Airways miles can be redeemed on Alaska Airlines as well. So if you inadvertently come across a really good Alaska Airlines flight in your search, you can book that with you British Airways miles too! For my example, I am going to try to find flights from Miami to Grand Cayman in December. 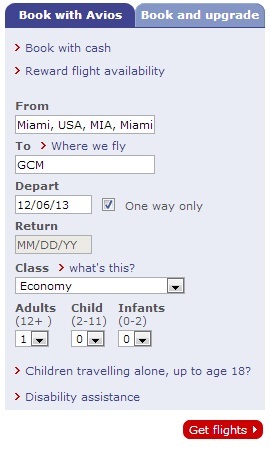 First, I go to American Airlines and type in my cities and dates. On the next page, I get a calendar view of all my available flights. I can even narrow down to the non-stop flights (since those are the ones that will cost only 4,500 British Airways miles). 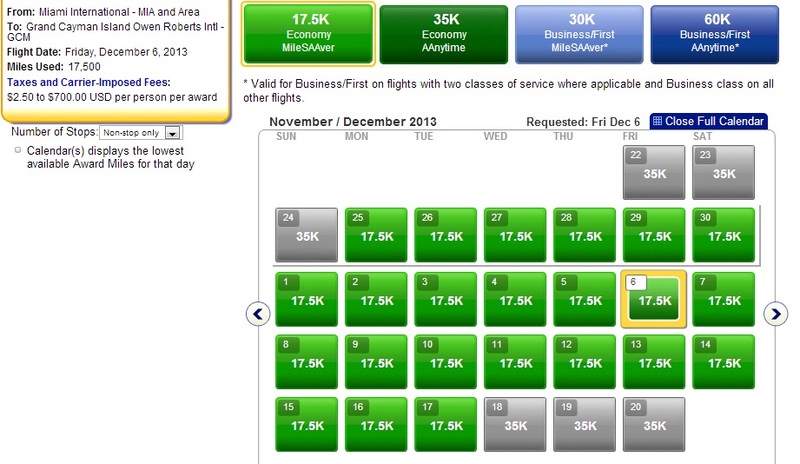 I can book with British Airways Avios any flight in light green or light blue. These are the MileSAAver level. Dark green and dark blue are off limits and will not be available with British Airways miles. When I choose a day and click ‘Continue‘, the next page gives me the individual available flights. At this point, I just want to write down the flight number since I am not going to book them on American Airlines. I am going to book them on British Airways. Pay no attention to American Airlines’ price of 17,500 miles. We are not going to pay that many miles! I will choose flight 1007 at 7:30 pm. You also want to find a return flight, write it down and then move on the next step… booking the flights with British Airways miles! Although you can search for American Airlines award seats on the British Airways website, I find the American Airlines website much friendlier and easy to use with its convenient monthly calendar view. On British Airways, you have to click on each day individually. That’s why I find it best to be prepared with flights from the American Airlines website before even visiting the British Airways website. 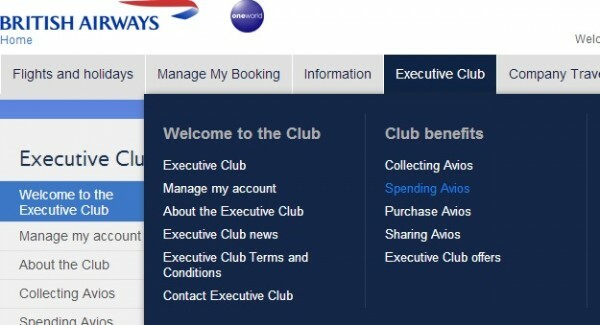 Once on the British Airways website, go to Spending Avios under Executive Club and you will be asked to log in. British Airways has a glitch where it sometimes does not show flight options if you search round-trip. (This nearly drove my cousin Diana insane when she was trying to visit me in NYC). If I want to make changes later on, it’s easier to have the flight as two separate legs allowing me to adjust a single leg. Since I already searched the American Airlines website for award availability, I expect the exact same three flights I found on the last step to be available now. And, of course, those are the exact flights that show up! And, finally, on the very last page, I see the final price. It is 4,500 British Airways Avios from Miami to Grand Cayman as this flight is under 650 miles. That’s a great deal! Remember how the same flight was 17,500 American Airlines miles? There’s even the Avios and Money option to pay part of the cost with cash if you value your Avios highly. Of course, you’ll need to do the same for the return flight (expect to pay around $50 in departure taxes from Grand Cayman). Trans­fer from Star­wood Pre­ferred Guest at 1:1 or get 25,000 British Air­ways miles for every 20,000 Star­wood Pre­ferred Guest points transferred. These can be earned with the Star­wood Amer­i­can Express card. Trans­fer from Amer­i­can Express Mem­ber­ship rewards at 1:1. Trans­fer from Chase Ulti­mate Rewards at 1:1. The British Airways Visa Signature® Card co-branded credit card. With British Airways’ distance-based chart that charges per segment based on miles flown, we can save lots of miles by booking short flights on American Airlines using British Airways miles. We can book flights we find at the American Airlines MileSAAver award level (light green or light blue) only and it’s best to search on the American Airlines website for award availability. American Airlines flights can be booked online by visiting the British Airways website.